In ancient times, cheese was made primarily from sheep's milk, notes University of Maryland sheep and goat specialist Susan Schoenian. Sheep's milk is sweeter than cow's milk and produces a cheese that contains more fat, protein and calcium per serving than cheese prepared from cow's milk. The most popular type of sheep's milk cheese in the United States is Pecorino Romano, a hard cheese made in Italy. You can use it on pasta, vegetables or bread as a substitute for grated parmesan. 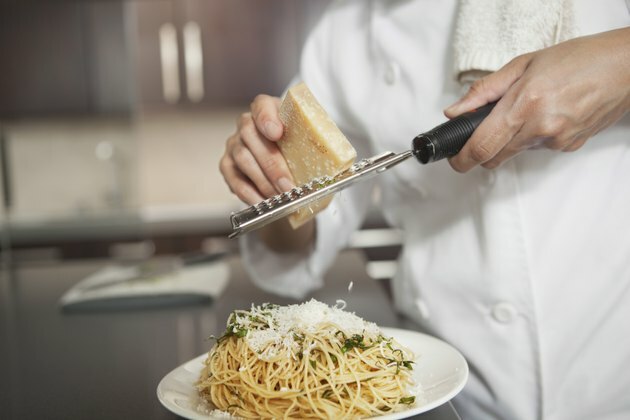 A 1-ounce serving of Pecorino Romano contains 110 calories with 70 calories coming from the 8 grams of total fat, almost all of which is saturated fat. If you're a healthy adult on a 2,000-calorie diet, this amount would be 33 percent of your daily value. Each ounce of Romano cheese prepared from sheep's milk contains 30 milligrams of cholesterol, or about 10 percent of your DV. Cheeses prepared from sheep's milk also contain the omega-3 fatty acid, conjugated linoleic acid, as noted in the February 2011 issue of "Today's Dietitian." CLA may help reduce high blood cholesterol, lower your risk of cancer and aid in weight loss, although more research is needed, according to the Memorial Sloan Kettering Cancer Center website. In addition, sheep's milk cheeses, like Pecorino Romano, are easier to digest than cow's milk cheese since they contain more short- and medium-chain fatty acids. Pecorino Romano has 7 grams of protein in each ounce. Adult men need approximately 56 grams of protein each day, which means that 1 ounce of this cheese would supply nearly 13 percent of that daily requirement. For adult women, who need approximately 46 grams of protein each day, 1 ounce of Pecorino Romano would fulfill almost 16 percent of their protein needs. Each 1-ounce serving of Pecorino Romano provides 25 percent of the daily value for calcium, based on a 2,000-calorie diet. Sheep's milk cheese also contains a small amount of other vitamins and minerals, including 8 percent of the DV for vitamin A.
Sheep's milk cheese like Pecorino Romano is high in sodium, as a 1-ounce serving of this cheese contains 550 milligrams. The American Heart Association recommends that adults aim to limit their sodium intakes to just 1,500 milligrams a day to reduce the risk of cardiovascular disease. Can Eating Cheese Cause Weight Gain?